Zot! is the sound that Peter makes when eating ants—Peter is anteater and a comic character from Johnny Hart’s B.C. comic. In case you weren’t aware, the mascot of UCI is an anteater, and was actually inspired by “Peter the Anteater” from that same comic. Yes, our mascot is also named Peter. UCI is all about the student, and it becomes apparent from the anteater, because it’s actually a student-chosen mascot. The 1960’s was a very popular time for students to say their peace. In fact, Aldrich Park was designed full of hills for the sake of discouraging student riots. So, instead of taking student opinions to the street, they took it the polls. 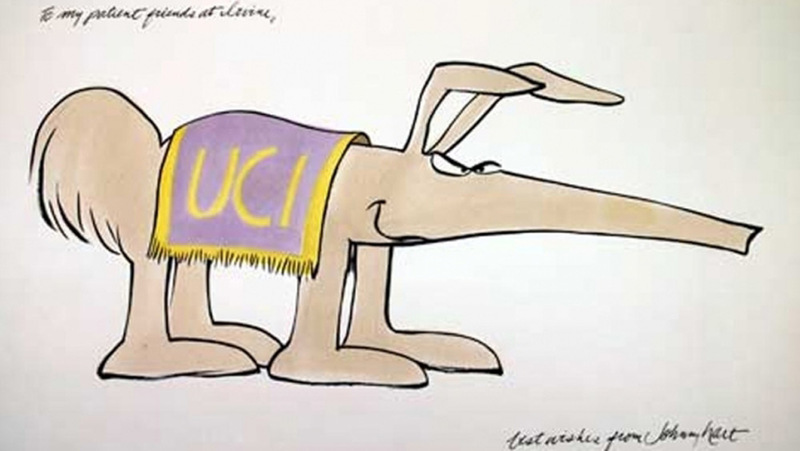 1965 was the year that UCI gained its mascot by a vote. At the time, a high staff official gave a few options of what could be voted to be the official mascot. Rumors spread of what they were; long story short, they were unpopular. So, “the man” was trying to force the students to vote for very unpopular candidates. The idea of voting for a student-chosen mascot then also started to spread. It wasn’t until a game at a UCI men’s water polo game that students began to be unified under one mascot idea—the anteater. Thanks to the men’s polo team, the anteater became a real contender. When the voting ended, the anteater was officially chosen, with 56% of the vote. Guess what came in second? “None of the Above” in fact. Going against “the man” may have been more popular in the ‘70’s, especially after the Vietnam War, but UCI was already unifying against officials, but in a peaceful, productive way. So, when you see Peter the Anteater, just know how much he does represent the student body, of the students, for the students, and by the students.